Phuket has always been a favourite beach destination for Singaporeans. Most would associate it as a venue for romantic beach getaway or a party central location. On the other hand, families with younger kids might not have the impression that the island 1300 km away would be an ideal destination for kids. To be a little honest, we were skeptical too... until the last trip during the December holidays. In fact, the kids probably had the lion share of fun during this trip to Phuket. So much so , it warranted a feature on our Holiday for kids series. So take a dive into this post and discover Phuket for kids! All Recommendations are certified tested by TheWackyDuo and on own our tabs. 100% Real Life experiences. In lieu of reported cruelty to Elephants for Elephant rides, TWD had decided that this should be off the list. You may want to consider visiting an Elephant Sanctuary instead where you can interact the Elephants in a more positive manner. There are no riding and bathing with the gentle giants. Instead you will learn more about their habitat and have a chance to feed them while at rest. Try Phuket Elephant Sanctuary for a more humane experience with the elephants. Island hopping is a must do while you are in Phuket. There are 2 favourite options available , the Phi Phi island tour as well as Phang Ngan Bay tour. We took the latter option as the ride is smoother on a speedboat . Phang Ngan Bay is located within the bay and the waters are calmer in comparison to the open seas towards Phi Phi Island. Our Phang Ngan Bay Tours includes exploration of Hong Caves on foot and canoe, a visit to the floating village Ko Panyi, a dip at a secluded beach at Krabi and more. The standard of speedboat tours differs from different operators. We had heard horror stories of 40 people squeezed into a speedboat meant for 25 people. Thus the choice of the 'right' operator will determine the experience. Based on recommendation on tripadvsior, we set sea with Phuket Sail Tours. It was a splendid choice as their itineraries differ slightly from the normal touristy crowds. You will experience the major attractions without the crowds, making it a getaway we will always remember. A bonus, kids are well taken care of during the trip. Book in advance to avoid disappointment as their daily tours are always full. Take the Phang Ngan Bay tour if you are travelling with kids. Having experience RWS Trickeye and having tons of fun in it, we decided to give Phuket Town Trickeye Museum a shot. The huge layout and the many different murals of both local and international settings are a hit with the kids. It is well worth the hour plus we spend there. If you are making a trip down to Phuket Town, this is one attraction not to be missed! Phuket Butterfly Park is one of the extra stop recommended when you are planning a trip down to Phuket Town. Located near Baan Teelanka, it is an open garden where butterflies are breed and left to fly freely. You can also chose to feed the hundreds of kois found in the pond in the middle of the park. If you want to explore the insect world, an hour there should be suffice. Fish food is available for extra cost. One packet should be sufficient. 71/6, M.5, Soi PaneungYaowarat Road, T. Rassada A.Muang, Phuket 83000 Thailand. An attraction that Phuket is famous for is the Upside Down House ( Baan Teelanka). This is a 3 storey house that is inverted!. Everything in the house is nailed to the ceiling. You get a topsy-turvy feeling when you are In there. It does get a little crowded so it may affect your photos. The rule to photography there is to take a normal shot and invert it to get the upside down effect. The attraction can be covered in under one hour. The 950sqm Maze is located next to it and will cost extra if you intend to explore it. Go early to avoid crowd. Phuket is famed for its beaches. From the popular (and crowded) patong beach to the tourist friendly Karon and Kata beach. A day out at the beach is a must for a trip to Phuket. To make it even more special, go island hopping and land yourself on a private beach. We did that with Phuket Sail Tour and found ourselves snorkeling on a beach with less than 50 people. There is no beach vendors, lots of space and privacy. Billed as Phuket ultimate theme park, this is one place to visit with kids. 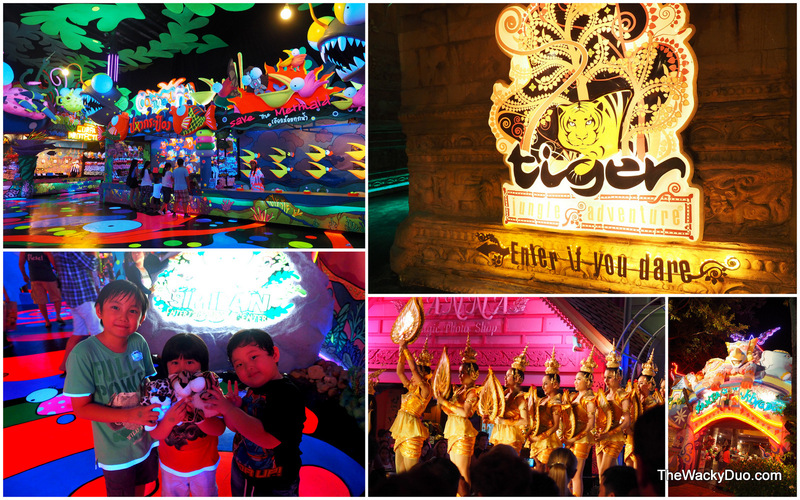 Other than the award winning "Fantasy of a Kingdom" show, there is a Similan Entertainment Center, A Tiger Kingdom , Elephant rides, Carnival Village Shopping street and live stage shows. This is a night activity stamped approved for kids! There are restaurants near Phuketsea, you might like to choose that instead of the Buffet + Show option. Ok, I will be the first to admit, Simon Cabaret may not be 100% suitable for kids. There are themes that some may find offensive. However it is not explicit and in some parts entertaining too. The performers are billed as 'more of a man than you will ever be and even more of a woman too'. It depends on your level of comfort if you decide to bring younger kids there. This is probably the latest indoor playground in Phuket located in the heart of Patong. Since The Wacky Duo are the local indoor playground veterans, they would love to experience an overseas indoor playground to add to their repertoire. Opened about a year ago, the indoor playground is well maintained. You can opt to drop your child or stay with them at the playground. There is a separate sitting area where you can enjoy a cup of tea and free wifi. Play wise, there are lots of different slides, flying fox, trampoline and even a mini football field located on its premises. We used the opportunity to take turns to look after the kids and shopped around Patong. Located directly opposite Juncelyon, the location is perfect for parents who needs a little time out while the little ones get their dose of Kinectic fun. Kidzoona and Molly Fantasy can be found side by side at Juncelyon. Kidzoona is meant for kids under 12 and has play areas where children can role pay, jump on trampoline and slide on large inflatable slides. Although the recommended ages is for 12 and under, we think it is more suitable for 8 and under. Older children might prefer the amusement rides at Molly Fantasy which is located at the side. Need time to shop at Juncelyon? This will be a good place for kids to explore while the adults do their shopping. Sometimes the best thing to do is to do nothing. If planning for a day out is too taxing, we recommend staying in your resort and enjoy the facilities such as such the pool. Trust us, the kids will not complain whenever they swim. 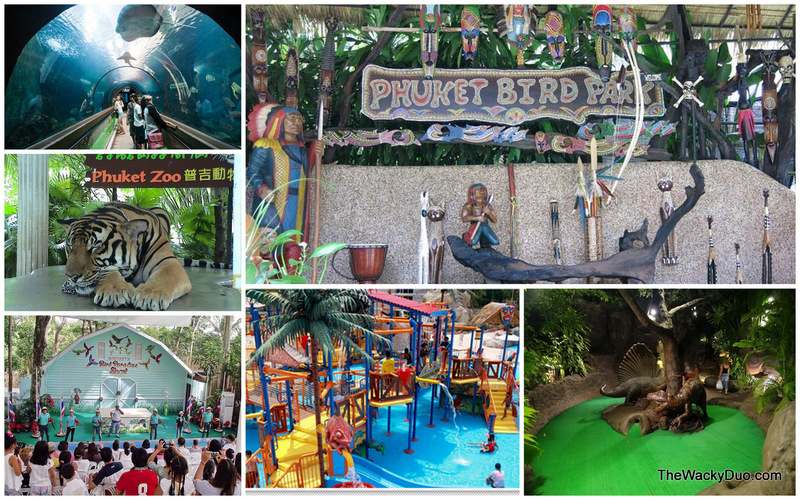 There are lots more kids friendly activities in Phuket to explore which we have not done so. This is a list of activities that we will KIV for our next trip. As for us, we will be back! May I know how did you get around in Phuket? Did you rent a car or did you hire a driver and call? Thanks. We took the hotel transfer to the main town and tuk tuk back. It's quite easy if you are going to tourist spots. For Phuket Sail , it was a return transfer as part of the trip package. Hi, did you book the trip to Fantasea at those daytrip counters/stalls ard patong? Roughly how much time would you recommend to enjoy the other attraction s in Fantasea before the show? Thank you for the article. I have found it very helpful except for the part with elephants. I have found that even if these kinds of places are certified it is because they want you to book it regardless. Using animals for amusement is wrong. However nice they are treating them elephants are not meant for a ride. They develop arthritis and back pain quickly. Please do not recommend it as it is animal cruelty. Hi Julia, Siam Safari was the only one certified by the Royal Thai Govt at that time . Unfortunately it had been closed . We would not recommend others due to the stories we read and heard about elephants cruelty . There are a few santuries without elephant trekking . Those are better options now .